"No," she screamed again. "NO!" the barbs raked along his snout. Drogon rose, his wings covering her in shadow. Dany swung the lash at his scaled belly, back and forth until her arm began to ache. His long serpentine neck bent like an archer's bow. With a hisssssss, he spat fire down at her. Dany darted underneath the flames, swinging the whip and shouting, "No, no, no. Get DOWN!" Order your own copy of In Daznak's Pit at your local retailer or online through our website today! The shadows of winter descend on Westeros. Evil conspiracies are formed in darkened corners and spoken of in hushed tones, but soon the time will come for those who would seek power to strike. 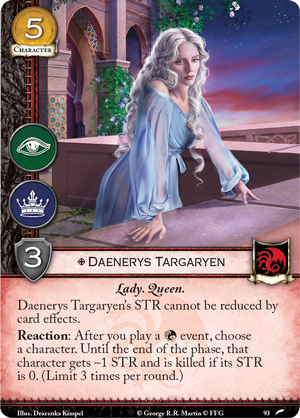 In the city of Meereen, Daenerys Targaryen must fight for the loyalty of her people as the Brazen Beasts plot her downfall. In King’s Landing, Cersei Lannister must contend with the Faith of the Seven, battling against the power she helped them gain. And in the North, the Boltons hold power for now. But those still loyal to the Starks are preparing to fight back. 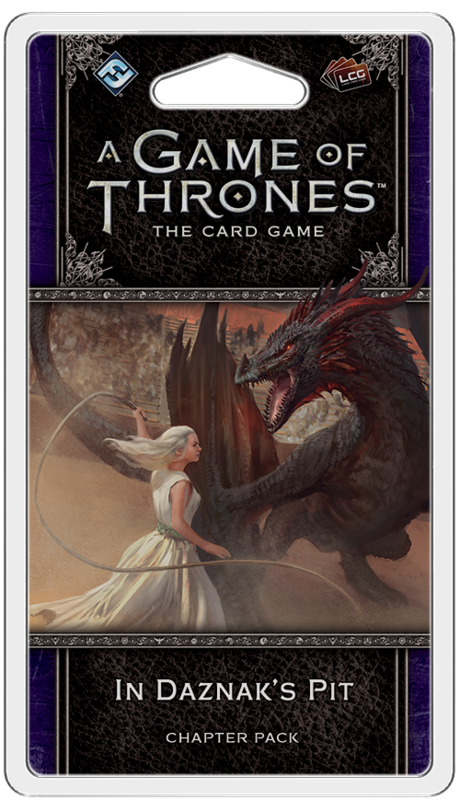 Fantasy Flight Games is proud to announce In Daznak’s Pit, the fifth Chapter Pack in the Dance of Shadows cycle for A Game of Thrones: The Card Game, now available for pre-order at your local retailer or online through our website! Continuing the themes of the Dance of Shadows cycle, In Daznak’s Pit provides you with a plethora of cards that feature the new shadow keyword. As we see throughout the cycle, the shadow keyword encourages you to embrace the clandestine intrigues of George R.R. Martin’s A Song of Ice and Fire by creating a new way for you to lay your deadly traps. For the price of two gold, you may play a card with the shadow keyword (also indicated by a purple banner in the upper left corner of the card) facedown into shadows. 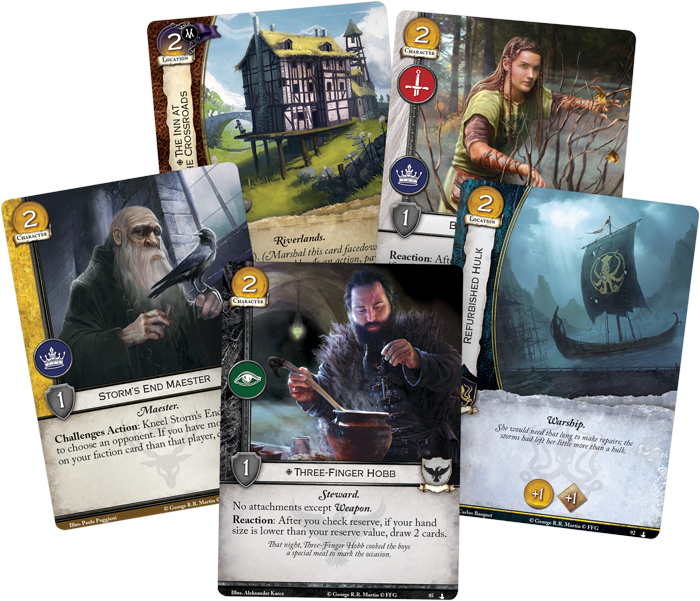 Shadows is a new area separate from both the play area and your hand, where you can protect your most precious cards from military and intrigue challenges, and spring them on your opponents when they least suspect it. When you are ready to reveal your plans, you can pay the card’s shadow (X) cost to bring it into play. Yet even with the inclusion of this deceitful keyword, you are far from defenseless. 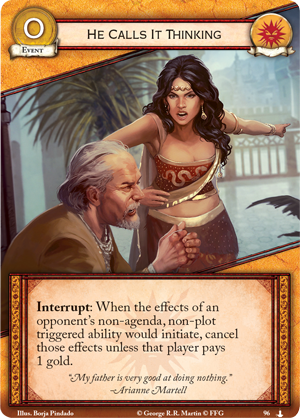 In Daznak’s Pit offers you tools to counter your enemy’s shadowplay without stooping to their underhanded methods. He Calls it Thinking (In Daznak’s Pit, 96) features a powerful Interrupt ability that lets you cancel an opponent’s non-agenda, non-plot triggered ability, unless they pay one gold. This seemingly simple card has the potential to shred your opponent’s plan. Either you cancel their ability or they pay a gold, which can mean the difference between whether or not they will be able to carry out their plans. With the dramatic increase in cards with abilities triggered by coming out of shadows, a little preparation can go a long way. The Great Pit of Daznak is the largest and most extravagant of Meereen’s fighting pits. The violence worshipped by the cheering masses in this location is reflected in the event In Daznak's Pit (In Daznak’s Pit, 94) which forces each character, already bloodied and wearied, to return to battle. When the Challenges Phase ends, you can play this event to cause each character to stand and immediately launch into an additional challenges phase! As this card does not have a gold cost, it cannot be played normally—you must marshal it into shadow. Still, this is a small price to pay. 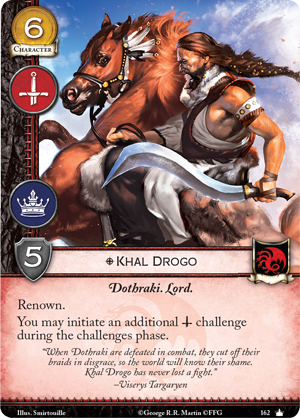 If you have a two-claim plot combined with Khal Drogo (Core Set, 162), or you have Blood of the Dragon (No Middle Ground, 75) revealed, a second challenges phase can let you completely wipe out your opponent. Warriors, wolves, and elephants are far from the most dangerous things to be found in the fighting pits. 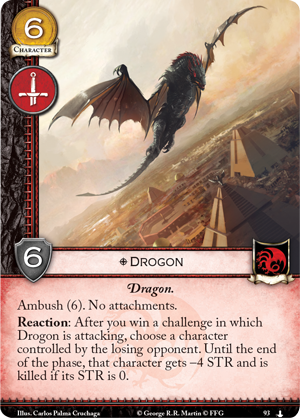 Drawn by the commotion and violent spectacle, Drogon (In Daznak’s Pit, 93) returns to A Game of Thrones: The Card Game. 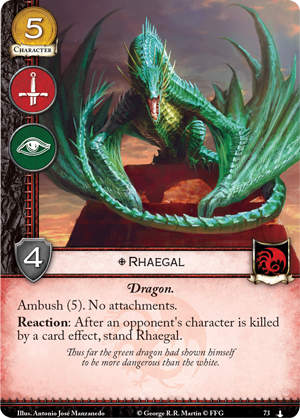 In the time that has passed since his first appearance (Core Set, 161) in the Core Set, he has grown in size and strength, surpassing even his brother, Rhaegal (Music of Dragons, 73). The most murderous of Dany’s dragons, Drogon is a creature of fire and blood—the Targaryen words made flesh. 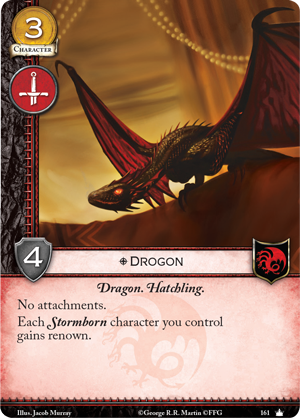 Unlike his Hatchling form, Drogon can no longer provide his mother with renown for the simple miracle of his existence. 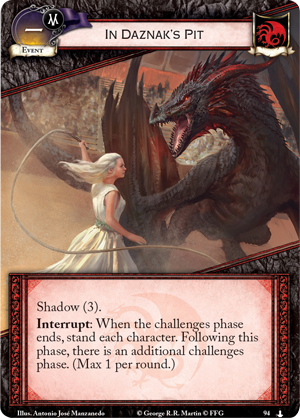 Instead, after this Dragon wins a challenge, you have the ability to reduce the STR of one of your opponent's characters by four, killing them if their strength reaches zero. 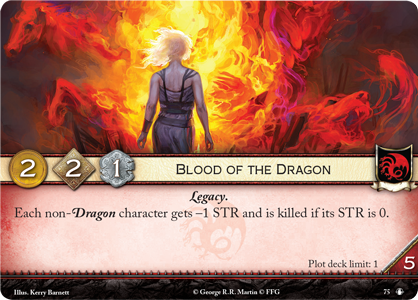 This nearly mirrors the effect of the player-favorite Dracarys! 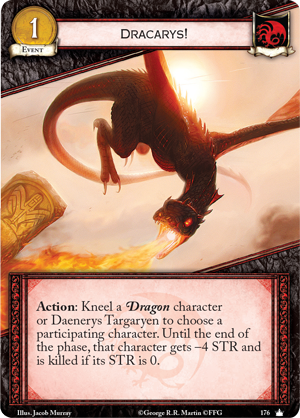 (Core Set, 176), but without requiring you to kneel Daenerys or one of her Dragons. Plus, where Dracarys! 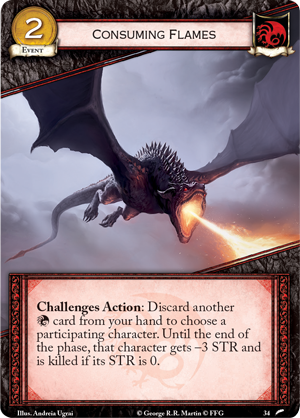 is a single-use event, Drogon is a formidable character with a STR of six, meaning your opponent will have a staggering task before them if they wish to stop him in combat. Strengthen him with A Dragon Is No Slave (Guarding the Realm, 34) or Consuming Flames (Journey to Oldtown, 34) while Daenerys Targaryen (The Faith Militant, 93) is in play, and you will see why he is believed to be the reincarnation of Balerion the Black Dread himself. Give in to your bloodlust. 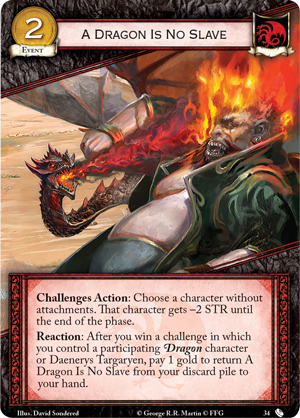 Add the might of In Daznak's Pit to your collection when it comes to your local retailer in Q3 of 2018 and prepare to claim what is rightfully yours! Pre-order your copy of In Daznak’s Pit (GT35) at your local retailer today or on the Fantasy Flight Games website here!